from the Crohinga Well magazine: Psychedlic folk (rock) is really blooming in the 90�s and it�s very encouraging to notice that in alot of different countries fresh variations or even new species pop up like mushroom circles in the shade of a wood. 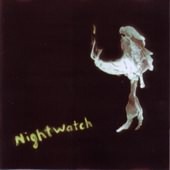 Nigt watch is one of Holland�s more talented contemporary folk ensembles who (privately) released their eponymous debut LP in 1998. September Gurls picked up this remarkable album, added one track and reissued the already rare LP as a CD. A good initiative because Night Watch is a very talented and versatile folk unit that harbours a lot of experience in its 3 male/3 female ranks. These six musicians play a beautiful and rich mix of different folk styles ranging from the traditional British formula through dark Brechtian atmosphere to late 60�s European psych/prog/folky rock. Apart from the standard electric guitar, bass and drums, their instrumentarium includes a variety of keyboards, mandolin, harmonica, whiste, flue, sax, melodica, vibraphone, violin and oboe. male or female vocals sing the lyrics of the 10 tracks in either English, German, Dutch or Swedish (quite rare within the context of one album). Anyway, this is a very recommended CD that will please both folk aficionados and fans of European late 60�s/early 70�s alternative music. Cultural diversity can be a thing of beauty. from the Rockerilla magazine and written by Enrico Ramunni Nocturnal atmospheres from Northern Europe quiver inside the grooves of an original debut opus, an identification card for a Utrecht based quintet, promptly brought to our attention by the long-sighted September Gurls. The night we are dealing with is, however, one of those, short and never completely black, which are typical of the summer season above a certain latitude, animated by the singing of the crickets, and perfect to resume folk songs of a seducing chamber intimacy, marked by the sweet timbres of wind instruments (Judith Simon�s oboe, Christie Rosseel�s flutes, Jacob Goud�s saxes), by the lyrics partly drawn from the academic tradition, by the succesion of almost all of the idioms of the Anglo-Saxon galaxy (from Dutch to German and from English to Swedish). Marcel Koopman masters the whole sonic thread of the band, adding a profusion of guitars and basses and a minor amount of percussions and keyboards, besides sharing the role of vocalist with Christie. Nanette van Amerongen�s dusky violin completes an unusual and crafted line-up, capable of writing articulated and harmonically complex songs as well as of relaxing in quiet Byrdsy horse-rides, of makin� time with folk-progressive fancies (the opening track "Utterly in Vain" reminds of Coums and Gryphon in an equal amount), and of distilling graceful Northern chants of absolute candour (as in "Den sista sången", on a lyric of the Swedish poet Dan Andersson). As we were saying before, the passion for poetry, especially referred to the first half of the century, is evident in the recurring choice of giving a musical vest to eminent texts of the past; besides Dan Andersson, also honoured in "Helgsdagskv�ll i Timmerkojan", other "victims" are his immense fellow-citizen P�r Lagerkvist, the "moralist without a faith" and Nobel Prize for Literature winner, whose tender "Det �r vackrast" unfolds his cloak in the darkest hour of this session, and Georg Trakl, Austian poet who had a certain confidence with darkness, "lending" us, in fact, two episodes of his cycle "Nacht". Besides the sensible choice of others� texts to garnish with notes, Marcel Koopman also shoes an uncommon ability with words of his own, also with some playful spirit, judging, for instance, from the funny and at the same time romantic "Means of Transport", among the most distinguished things also from the musical point of view. As charming as often result those bands of Continental Europe bold enough to keep at a distabce in a gentle but resolute fashion from the Anglo-American models, the Night Watch intend to cast their spell on all the acoustic fancy-goods that will cross their paths.